"God have mercy...I met with this on my way to Abk. 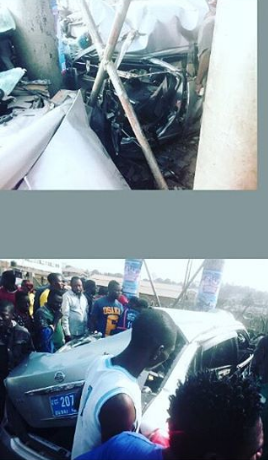 This happened on Ring-road,Mobil Ibadan at exactly1am this morning... Four people in the car,three guys and a lady...one of the guys just got back from Dubai(platenumber) last week that was what prompted their outung...,they were coming back from club and their car jumped to the other lane at a high speed and hit a big iron billboard. .the lady is a student of unilag..her family are yet to know she's late..they all died nobody survived...the most painful thing is the lady who lost her life. All the way from unilag...Ladies' love for money and material things this days is something...#brutal #death #godlythings #highness #speed #allinthenameofballingandshowingoff #liveswasted"